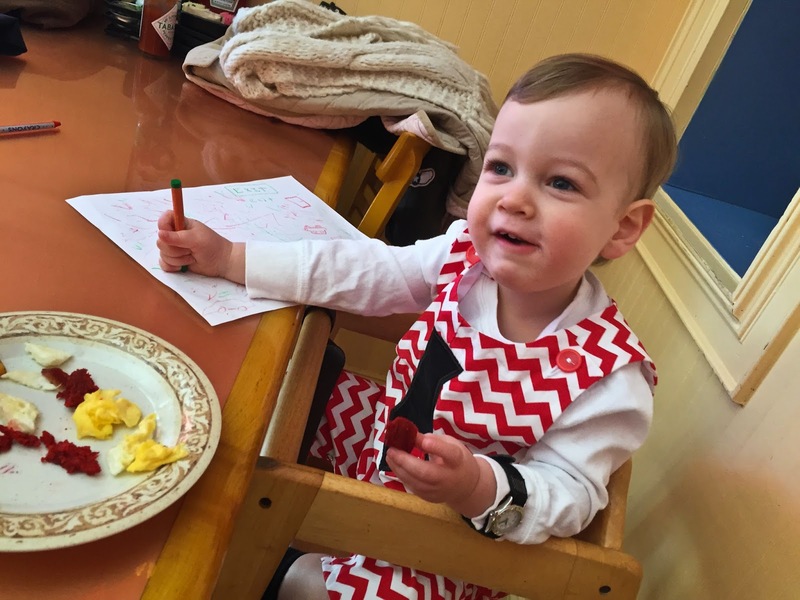 Max was away on business for Parker's first Valentine's Day last year, so this was my first year celebrating Heart Day with both my Valentines. My heart could not have been more full. 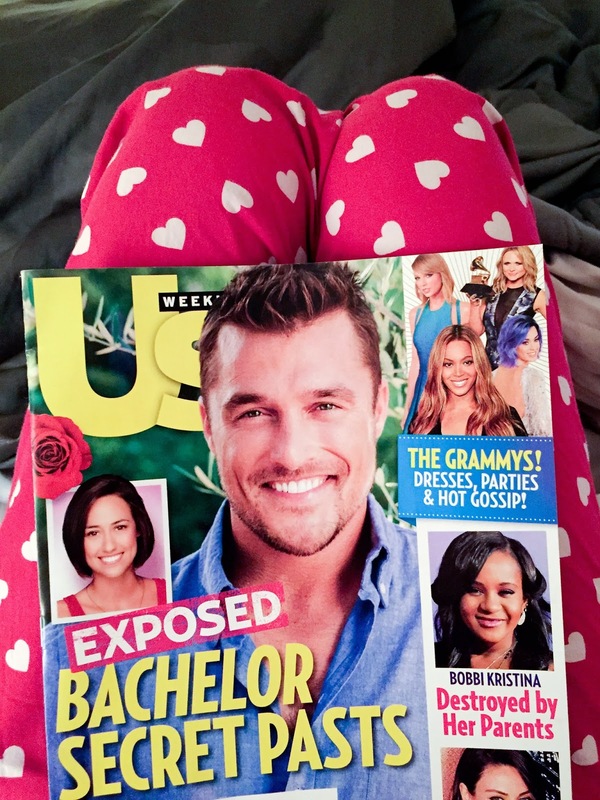 Plus, my favorite holiday fell on a Saturday this year so we got the entire day to bask in red and pink heart goodness. We woke up and headed directly to brunch (after I found flowers around the house that Max placed while I was sleeping - sweetest thing ever!) . This was my first Heart Day in a cold climate, and I must say that all my cute Valentine themed clothing is for California/the desert (i.e. short sleeved and not gonna happen). I managed to get my pink on while my boys opted for red. While we were waiting for our brunch table, we popped into the Hobby Lobby that was next door. This was my first time in the Alabama Hobby Lobby and it was probably five times bigger than the one in Phoenix. Also, Hobby Lobby is chalkboard Mecca. Thankfully my husband was there to steer me away or I would have adopted another one. 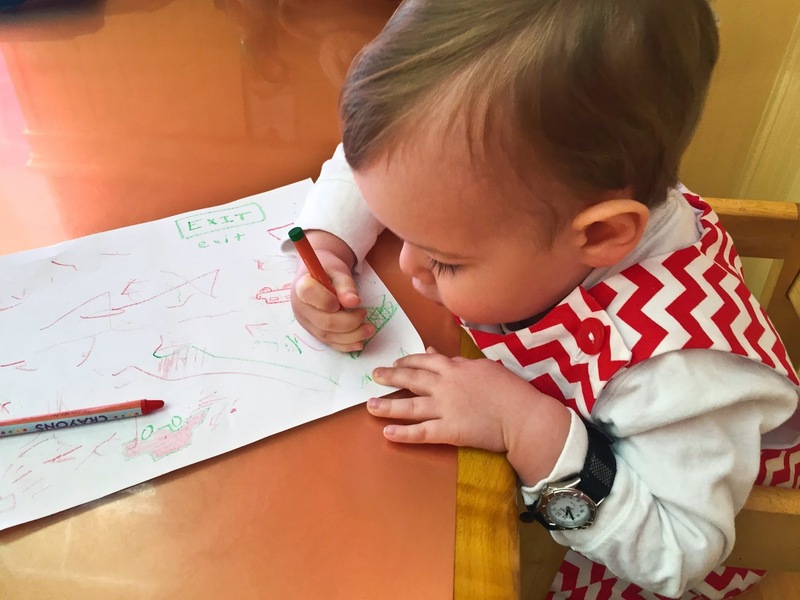 Parker was the best little man while we waited to be seated, and then was happy as a clam to be coloring at the table. 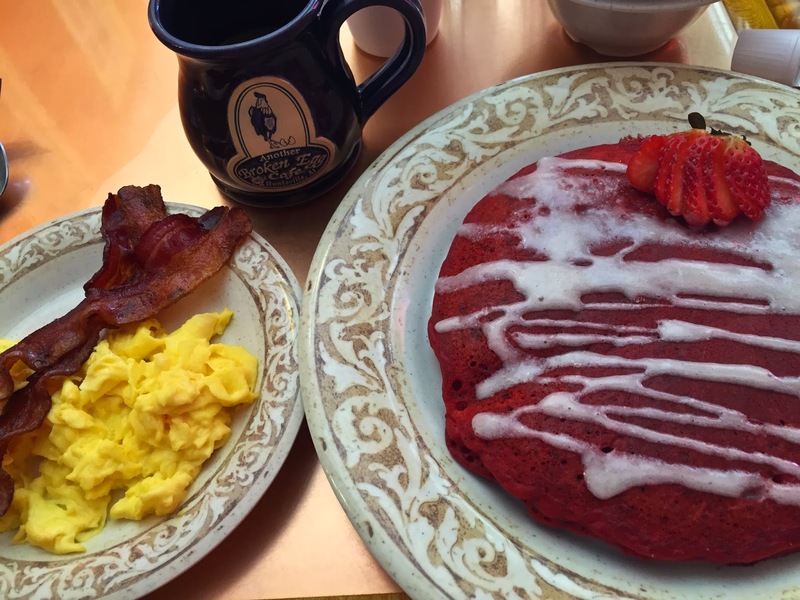 I had to go with the special red velvet pancakes in honor of the day. 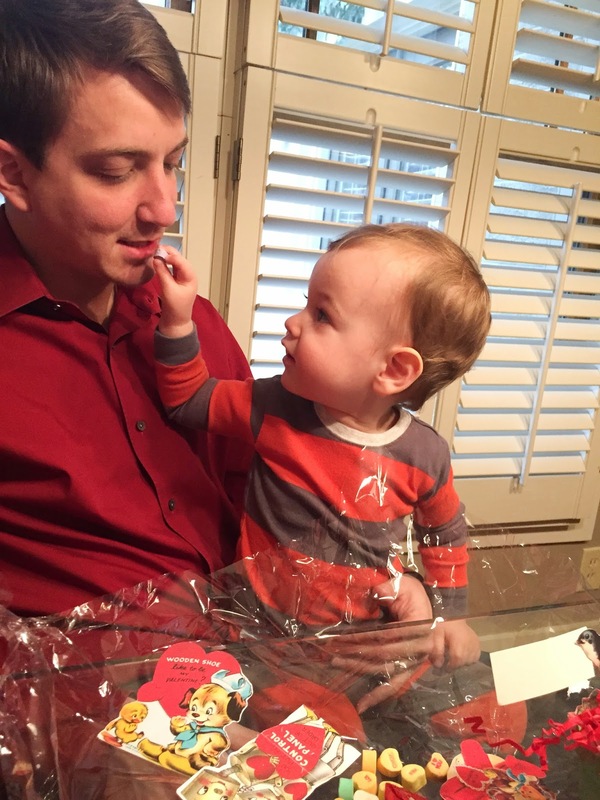 I shared with my littlest Valentine who thought they were yummy, too. We came home and opened Valentines and made the rounds to the neighbors to drop off cookies (but no one was home!). 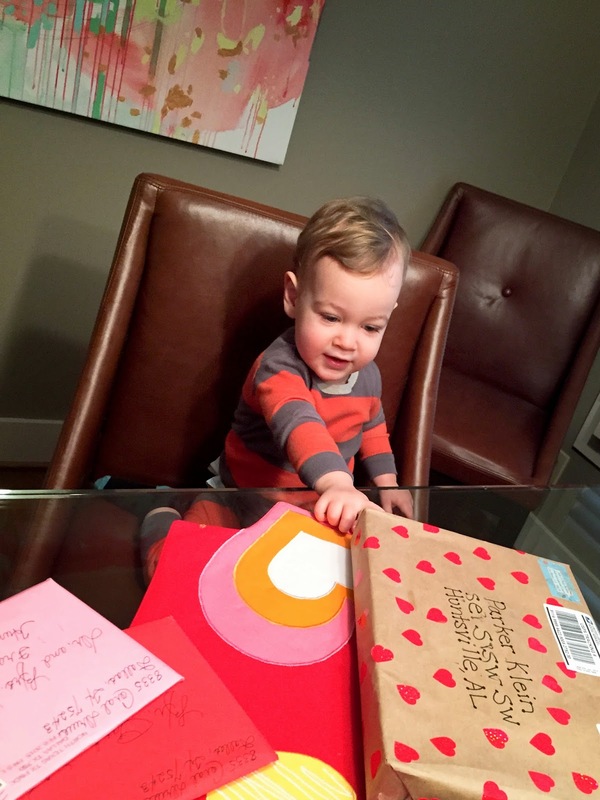 Sweet Parker shared his Valentine goodies with Dada. We managed to get the curtains finally hung in Parker's room (and by we I mean Max, with Parker and me cheering him on and telling him where they looked good). 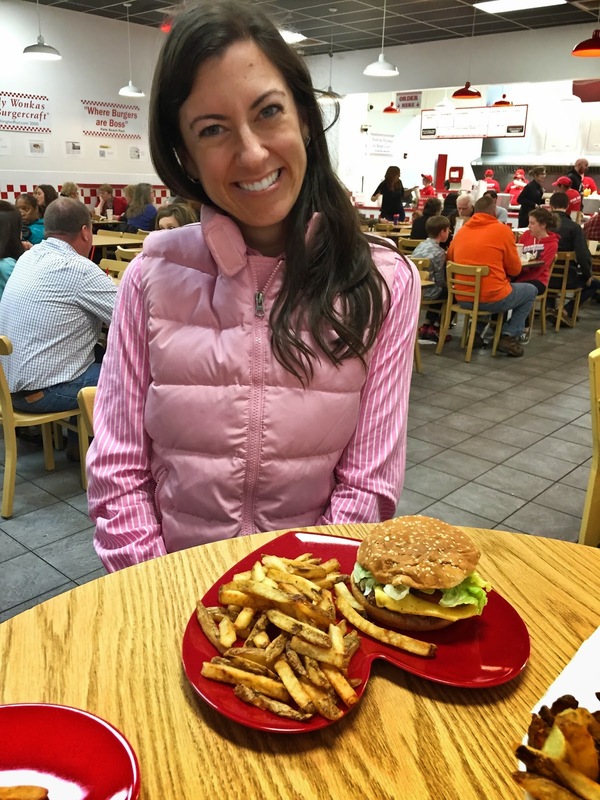 Our dinner plans were fuzzy - we had debated picking up Thai and bringing it home (I am a forever fan of a Thai picnic), but we opted last-minute to head out to Five Guys. 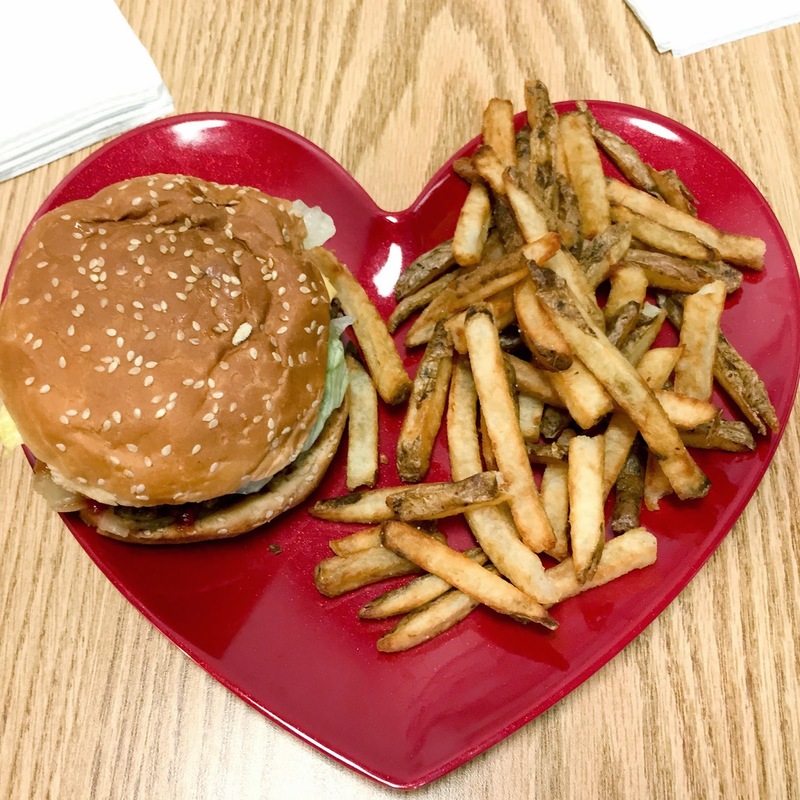 Yes, I brought our own heart plates. Really, it was to be festive, but after dining with them it made me realize how much nicer it was to have them. I think that in the future, I will forever bring themed plates when we dine out at Five Guys. I was all sorts of happy at dinner. Partially because of my plates, but mostly for being able to spend my day with the best valentines. And Parker was just happy to be eating ketchup.